I’m always up for more vegetables, especially when it involves my number one superfood, kale and rainbow coloured Swiss chard. If I were banting, this is what I’d like to eat as often as possible. 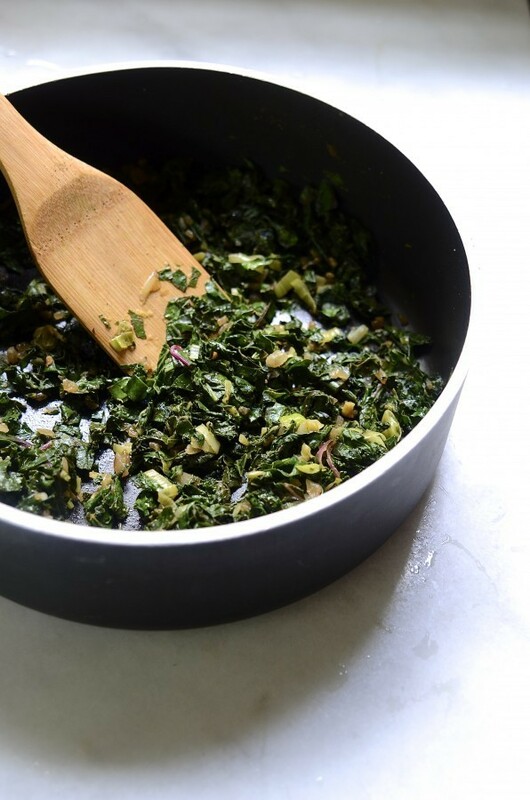 An aromatic Middle Eastern inspired Swiss chard frittata also known as a ‘kuku’ in Iranian cuisine. It’s spiced with cumin, coriander and just a hint of chilli. So just imagine packing all this ‘good for you’, vibrant luminosity into one dish, with melting mozzarella and pockets of creamy feta! Honestly, I’ve made this dish twice in one week and it’s only Thursday. With the second frittata, I added a handful of toasted pine nuts which adds a nutty flavour. I’m going in for my third frittata today as it’s been requested by hard to please teenagers for school lunch boxes. As most moms would agree, any oppotunity to get your kids to eat more greens is taken up without hestiatation. If you like, make up a fresh garnishing salad with shavings of raw courgettes, cucumber ribbons, chopped mint, parsely and finely diced red chilli. Dress the salad with extra virgin olive oil, lemon juice, salt and black pepper. Serve the frittata warm with the fresh salad piled on top. If you’re a somewhat sceptical about kale, here are a couple of interesting facts on the health benefits that could convert you into an avid fan. – Kale contains 150mg of calcium per 100g compared to milk, which has 125mg. – The high fibre content assist in lowering cholesterol. – An excellent source of beta-carotene, which is believed to reduce the risk of certain cancers. – More vitamin C than an orange. 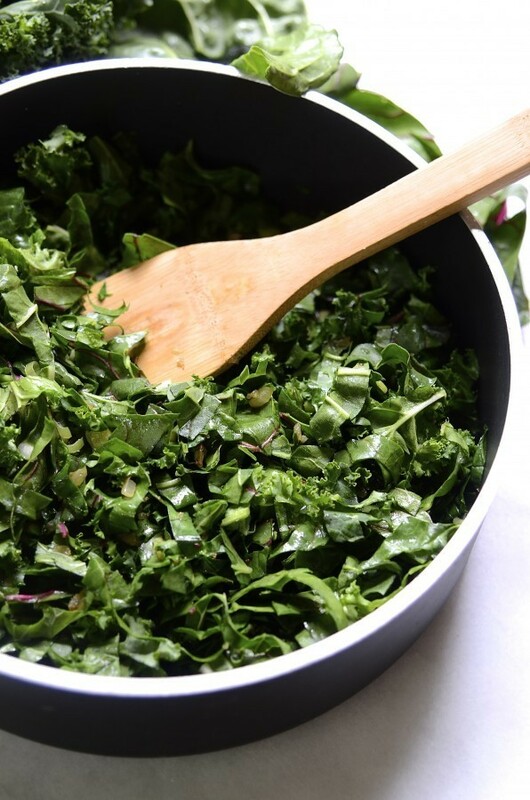 – The omega-3 fatty acids in kale is essential for brain function and helps with heart health. So there you have it. Let us know your favourite way of preparing this versatile vegetable……. For more a frittata recipes, this Tapas inspired Chorizo and potato frittata ticks all the Spanish flavour boxes with gusto! Preheat the oven to 180ºC. 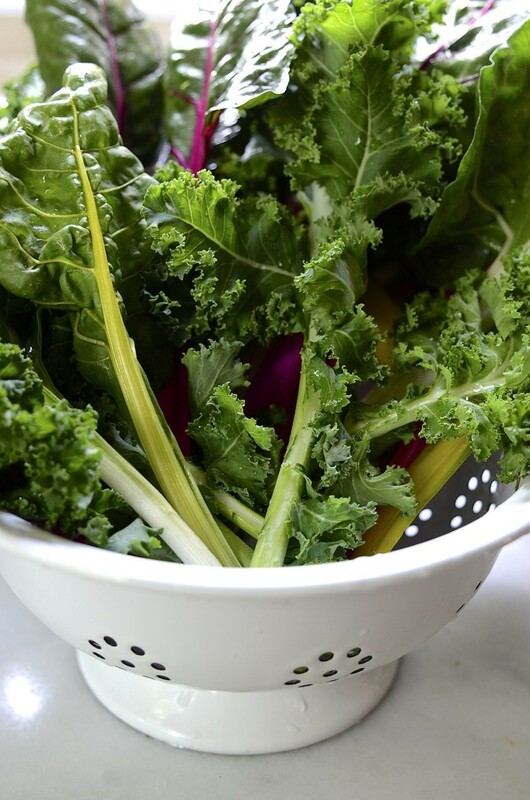 Rinse the chard and kale under cold water and pat dry. Remove the hard central stems from both vegetables. Layer all the leaves together, roll into a tight cylinder shape and chop into thin strips. You want the vegetables finely chopped as it’ll hold together better when cooked in the frittata. Heat the olive oil in a large frying pan and sauté the shallot until it is softened and slightly coloured. Add the leeks and cook for 2 more minutes. 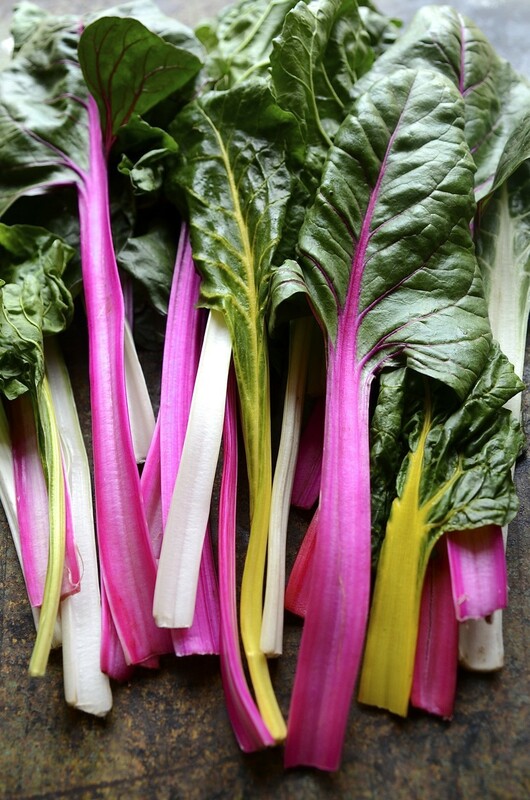 Now pile all the chard and kale into the pan and cook on a medium high heat until the vegetables start to wilt down. Add the lemon zest, cumin, coriander and chilli. Season with salt and pepper. In a separate bowl, whizk together the eggs and season lightly with salt and pepper. Mix in the mozzarella, cooked vegetables and chunks of feta cheese. You can pour the mixture back into the same pan, if it is oven-proof or into a greased 24cm round stoneware dish. Scatter with a generous handful of pine nuts, if you like and I like, so go wild! Cover with tinfoil and bake for 15 minutes. Remove the foil and bake for another 20 minutes Turn the oven to grill for a minute or two for a deeply golden top. 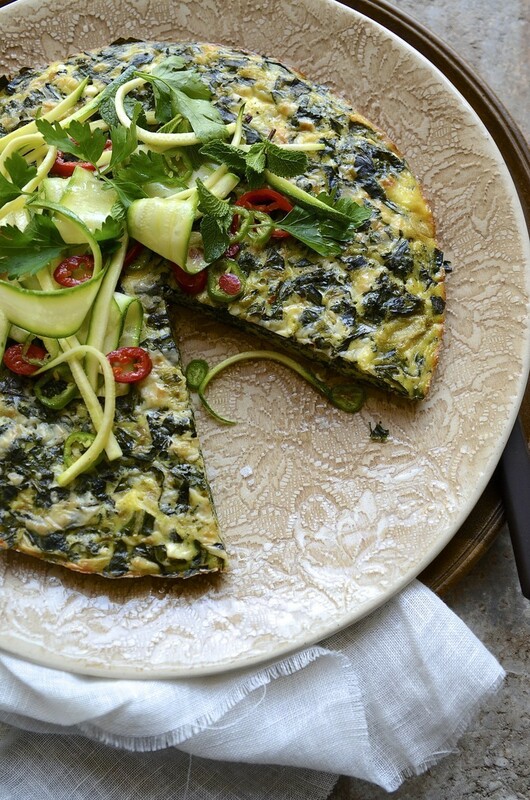 This frittata is best served warm but will do nicely for a packed lunch or summer picnic food. Have just eaten your chard and kale frittata for the second time- deicious! I shall be looking at your website for further inspiration. Hi Michele. So nice to hear that this frittata has made its way to York! It’s one of my favourites. So much green goodness packed into this easy recipe. 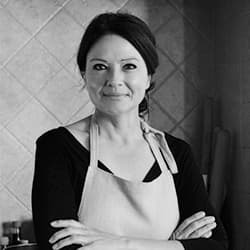 I hope you find plenty more delicious and healthy recipes on the blog.